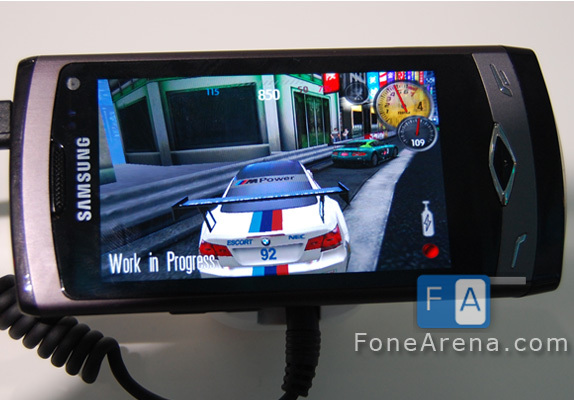 At MWC 2010 we had a chance to play Need for Shift on the Samsung Wave running on the Bada platform. Considering the fact that the Samsung Wave sports a Super AMOLED display and a 1 GHz Processor the game ran fast and graphics were decent. NFS Shift is produced by EA Games and is one of my favorite games on the iPhone platform. The Bada version was Work in progress as you can see in the image above. Its not a complete game and is just proof of capabilities of the Bada platform. But the graphics on the Bada platform were not on par with the iPhone version. We’ll have to wait and see how the final version looks like . The TV-out feature was pretty cool ! While we were denied a chance to record a video of th actual game play PocketGamer has a video below.